It’s not summer, but it’s time to start buying tickets for it. There are few things about summer that I like more than road trips and outdoor music. Here are some shows within driving distance that look like they’ll kind of rock. 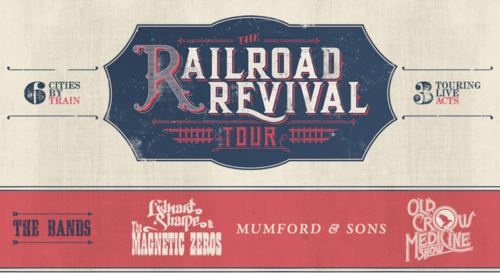 Railroad Revival Tour — Thanks to my fabulous friend Jeannie for posting about this tour — a six-city, down-South road trip in which Mumford and Sons, Edward Sharpe and the Magnetic Zeros and Old Crowe Medicine Show will travel by vintage rail car from city to city. Even though I think Mumford is the poor-man’s Avett Brothers, this still makes me want to tie a bag onto a stick and hop on a train Water for Elephants style. Mountain Jam — How could something called Mountain Jam not be amazing? Outdoor Air, and this one actually does have the Avett Brothers. It sounds like banjo-bonanza. Nelsonville Music Festival — Speaking of banjos, Kyle has been talking about this one for years, and I haven’t been…yet. But I did notice Bomba Estereo (who we saw last year at Bonnaroo) will be there. And it might be worth it for them alone. Latin music in southern Ohio — Appalachia, you always get it right.